Matzah was always made by hand until matzah-making machines began in the mid-19th century. The machines kneaded, rolled and perforated the dough, allowing the sheets to be moved into the ovens for baking. The best shape for working with the machines was square, as opposed to the round shape that was common until then. This avoided some of the major questions of round matzot. When shaping the dough into rounds, the corners were cut off and sometimes gathered together, re-worked and used for further round sheets of matzah. Dealing with the corners took time, and this sometimes transgressed the strict rules about the time limits between mixing the flour and water and putting the sheets in the oven. With square matzot this problem was evaded or at least reduced. Nonetheless Rabbi Salomon Kluger of Brody decided against machine-made matzah. One of his fears was that the machines would take away the traditional requirement that matzah was to be made with the mental intention of its use for the festival. Could a machine be relied upon to have a mind and an intention? 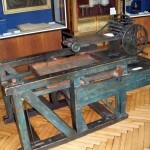 Rabbi Saul Nathanson of Lemberg championed the cause of the machines, averring inter alia that the speed of the new machines made it likelier that the time constraints set by tradition could be kept. The battle raged for decades and there are still many who prefer their matzot made by hand.